In this section we explain transformer and switching systems, which are basic methods for converting an AC (alternating current) voltage to a DC (direct current) voltage. As a summary of this section we will also compare the transformer and switching systems. This may be an obvious point, but in Japan the electricity that is delivered to homes and buildings is mainly 100V and 200V AC. That said, most electronic circuits built into products that run on electricity operate at DC voltages such as 5V and 33V. Although some devices, such as motors and incandescent bulbs, run at AC voltages without requiring any conversion, nowadays there are few simple devices consisting solely of motors and switches. Most of them feature some kind of electronic control circuits, all of which run on DC voltages. Incandescent bulbs are now increasingly being replaced with LED lights, and as you may know, a LED is basically a DC device. Therefore, the answer is that the electricity that we receive from transmission grids is AC, the electronic circuits that lie at the heart of electrical gadgets run on DC, and without AC/DC conversion electrical products cannot operate at all. Then you might ask, “If that is the case, why isn’t power transmitted in DC to begin with?” Well, there are reasons for power transmission in AC, partly historical in nature. You may know that it was Thomas Edison who invented the incandescent lamp in 1881. Actually, in those times in America, the standard method for power supply was DC. In order to accelerate the spread of incandescent lights, Edison embarked on a business of expanding DC 110V transmission grids. Transmission in DC, however, suffers from the problem of significant voltage drop, so much so that the maximum distance over which power can be pumped for practical purposes is 1.5 km, which would have required construction of power generating stations right where people lived, in cities and towns – a scenario which would be unimaginable now. As an alternative, Nikola Tesla devised AC-based power generation, transmission and utilization methods, and fought with Edison in the so-called War of Currents. Ultimately Tesla and his camp emerged victorious – a turn of events that is felt even now – thanks to the advantages of the AC system that provides simplicity of voltage transformation, permits the use of thin and long transmission wires, and offers the capability to transmit power with little loss. Through the use of a transformer, AC permits simple voltage changes (stepping up and down). High-voltage/low-current transmissions can reduce the problem of voltage drop (I²R loss). Because the conversion from AC to DC is also easy, AC facilitates the supply of power to DC-driven devices as well. In practice, electricity is transmitted from a power-generating station to homes as AC at high voltages of thousands of volts to 20,000V, and it is stepped down to 100V or 200V in a transformer that is provided on an electric pole just before the destination home. As a bit of a digression, in the present state of affairs, because power from the outlet in the home is AC, each device must have an AC/DC converter circuit. From power conservation and equipment downsizing standpoints, this is deemed wasteful. In the “smart house” concept for which research and trial runs are being conducted at various sites, a system is being considered where DC is directly supplied from the outlet in the home. This does not mean, however, that the power transmission grid will all of a sudden be changed to DC. The need for AC/DC conversion will not be eliminated. Such a system may still require high-power-factor, high-efficiency, large-power AC/DC converters as a master source for home DC supply devices, as well as local and medium-power-size AC/DC converters. Next we will review another basic concept. We mentioned above that “the conversion from AC to DC is also easy,” in an operation which is referred to as rectifying. 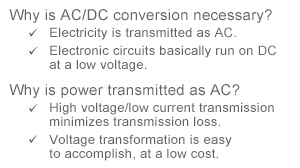 Since this is basic to AC/DC conversions, we need to make sure that we have a solid understanding of it. 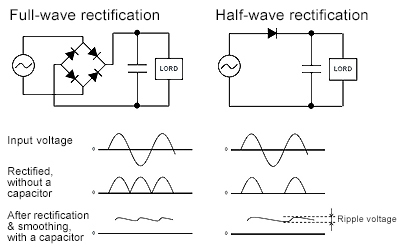 Figure 2 shows the operations of full-wave and half-wave rectifying, which are basic to the concept of rectification. In either case, a diode is used to clamp the negative-side amplitude of the input AC voltage. Half-wave rectification, which only clamps the negative side using a single diode, eliminates the negative component and produces half a waveform, as the name implies. Full-wave rectifying uses a diode bridge combining four diodes; it inverts the negative side and outputs it to the positive side, with the result that the full wave turns into DC. After the DC conversion, a capacitor is used to smooth out the waves. Even after the smoothing, the ripple remains, and the ripple voltage, which is the amplitude of the ripple, changes as a function of the size of the capacitor and the load. If the capacitor size and the load are equal, in terms of full- and half-wave rectifying, full-wave rectification results in a smaller ripple voltage. ・From an electronic circuit standpoint, AC/DC conversion is basic to DC power supply. Therefore, we must have a firm grasp of the basic theory.